My countertop is starting to look like a pharmacy counter- I have all my skin care products, my husband's skin care products and a whole bunch of products for my baby daughter's dry skin. So I was a little unsure about adding another bottle to my collection, but I'm so glad that I did! 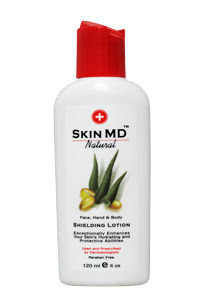 Skin MD Natural Shielding Lotion is different from your typical lotion. It doesn't just moisturize your skin, but it hydrates it while also blocking your skin from irritants that your skin is exposed to all day. According to the Skin MD website, the proprietary ingredient in the shielding lotion has a moisturizing factor that is at least 6 times greater than glycerin, the standard against which all products that promote rentention of moisture are measured against. I tested this product out on three of the four members of my household. I tend to have slightly oily skin on my face and have problems with dryness on my feet and my hands. I liked the fact that this shielding lotion went on smoothly and didn't feel heavy on my face at all. I tend to not use creams and lotions on my face as often as I should, because I don't like the way they feel, but this one didn't bother me at all. It left my face feeling smooth and moisturized but not heavy. I also used it on my feet and hands and was very impressed at how fast it took care of the ongoing dryness that's been bothering me. I only had to apply it once or twice per day for soft skin, instead of every hour as I had been doing with the lotion I was using before. My husband and my daughter both suffer from fairly serious skin dryness. In fact, my daughter's eczema has gotten so bad this winter that our doctor had us using hydrocortisone on her skin several times per day. I used the Skin MD on her and it worked just as well as the hydrocortisone to clear up the dry areas. And I didn't have to apply it as often as I did the hydrocortisone, which is a great thing for my busy schedule! My husband also really liked this shielding lotion and said that it worked well on his dry skin. The thing I liked best about this shielding lotion is that it can replace all the piles of skin products that my family has been using. Anything that simplifies my life is a great thing. And it uses natural products, so it's safe for use on everyone, which is wonderful. You can also get Skin MD Shielding Lotion with SPF 15, which I, as an incredibly pale person, need to put on my shopping list! You can buy Skin MD online for $18 for a 4 ounce bottle. This is definitely more expensive than a lot of the skin care products in my bathroom, but given the number of things that it can replace and how well it works, I think it's definitely worth the cost. Also, you only use a tiny amount of this lotion at a time, so a 4 ounce bottle will last quite a while! One of you is going to have the opportunity to win a full-sized bottle of Skin MD Shielding Lotion! Open to worldwide mailing addresses. Visit the Skin MD website and let me know something about the shielding lotion that I didn't mention here. 2. Put my button on your blog- let me know where to find it. 4. Visit LuvnLife and enter one or more of her giveaways! Leave a separate comment for each one that you enter. Entries will be accepted until 9 PM on January 22, 2010. I'll chose a winner with random.org and will email the winner who will have 48 hours to respond. Good luck! Disclaimer: I received a bottle of this lotion to use for myself for this review. I was not compensated for this review and all opinions posted here are mine and mine alone. i learned "Nearly everyone's skin is exposed to harmful chemicals on and off the job. That is why Shielding Lotions are so important. I entered Mayfair Lane Review and Giveaway at Luvnlife. I like the idea that it doesn't leave your hands feeling all greasy like most lotions do. I would love to win this. Please enter me:) Thanks! I became an email subscriber too!! I entered Luvn Life Hip T Giveaway. I also entered her Mayfair Lane Giveaway. It's made from deionized water (kind of like distilled water). Include a self addressed stamped envelope inside an envelope addressed to the address below and Skin MD will send you 2 sample packets containing 3 - 5 uses. Not only does the lotion help prevent water loss, but it helps promote the skin to make its own moisture. I cant wait to try this. I am a mail carrier and my hands are extremely dry!!! Skin MD Natural can be used for conditions such as psoriasis and eczema, as well as good old fashioned dry skin. Plus, it can be used on both the face and the body, which means less clutter on the bathroom counter! I love that! I entered the Nature's Paradise giveaway at LuvnLife. I'm your newest blog subscriber (via email)! I learned that Skin MD protects against dangerous toxins and irritants as well as to reduce the loss of natural oils and moisture. Shielding lotion is a lotion that forms a protective barrier on the skin and keeps out irritants and chemicals. It also allows the natural oils and moisture to remain in the skin so it can heal better. It is a shielding lotion keeps moisture-robbing irritants away from the skin while the proprietary "super" humectants hydrate the skin throughout the day. Entered the Natures Paradise giveaway @ LuvnLife! I learned that it's not oily or sticky, doesn't sit on top of your skin leaving a greasy residue on everything you touch, and it doesn't rub or wash off easily! I entered the Nature's Paradise giveaway at LuvnLife! I entered the Blush giveaway at LuvnLife! Skin MD Natural Shielding Lotion contains Methyl Gluceth-20. Methyl Gluceth is considered a special moisturizing agent due to its moisture retentive qualities and ability to open pores and follicles. Its therapeutic uses include atopic eczema, clogged pores, skin dryness, roughness and itching, wrinkles. I entered the Luvn Life Skin MD Shielding Lotion Giveaway. I entered the Luvn Life Orglamix Giveaway. I entered the Skin MD Shielding Lotion giveaway at LuvnLife! I entered the Black Diamond giveaway at LuvnLife! I entered the Make Ahead Meals For Busy Moms giveaway at LuvnLife!